President Donald Trump’s border agencies have released 100,000 migrants since January 2017 because of Congress’ catch-and-release laws, says an administration statement provided to the Washington Post. The Trump administration has freed about 100,000 immigrants caught at the U.S.-Mexico border in the 15 months since the president took office, newly released government figures show, despite repeated promises to end President Barack Obama’s “catch and release” policies. Under a June deadline, Trump’s deputies are devising fixes they can implement without approval from Congress. Since 2009, the catch-and-release policies have allowed at least 600,000 Central American migrants to seek asylum in the United States. The huge population has overwhelmed the asylum courts, causing multi-year backlogs. While waiting roughly two years for court dates, the adult migrants are allowed to take jobs at low wages, driving down wages for blue-collar Americans and legal immigrants. 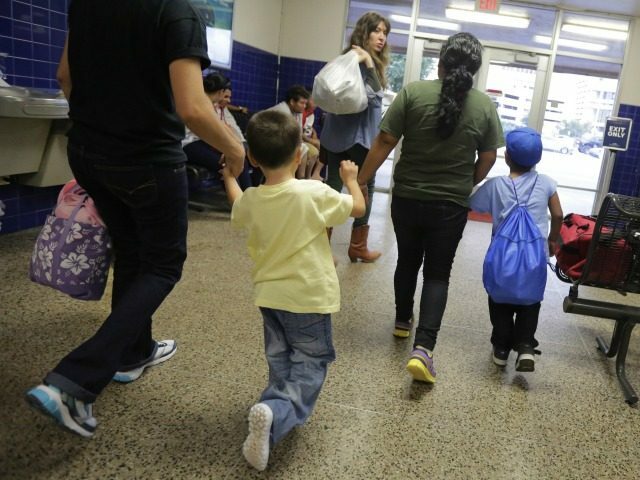 The migrant children crowd into public schools, pulling teachers, special-education resources and dollars away from the education of American children who are not enrolled in private schools. Some of the migrants are violent criminals who commit violent crimes and support the narcotics trade in Americans’ neighborhoods. Few of the catch-and-release migrants try to win their asylum case. Most prefer to blend into the nation’s huge illegal-immigrant economy, where they are mostly protected from deportation by progressives and business-first Republicans in Congress. Many in the catch-and-release population of children and parents are later joined by adult male relatives who cross the border illegally. The catch-and-release policies were begun by former President Barack Obama in 2009. But leaders in the GOP and Democratic Party have refused to reform the laws and court decision which prevent officials from detaining the migrating population of Central American youths and parents with children, pending their courtroom dates. In February, Congress blocked Trump’s border-law immigration reforms that would have ended the catch-and-release policy. In March, GOP leaders allied with Democrats to provide Trump with only $641 million for border fencing, signaling their support for the open-borders and cheap-labor policies favored by business groups and progressive political leaders. The bipartisan bill also rejected Trump’s request for additional detention beds. Last week, Trump ordered his agencies to come up with agency-only solutions to the problem. Attorney General Jeff Sessions is already pushing a series of reforms within the immigration courts.